Taking care of frosted glass mirrors is a fundamental practice for both home and office owners. You need to have the skills and tools necessary for the maintenance of frosted glass within your livings space or the office. For most homeowners, they consider taking care of frosted glass as entailing regular cleaning. Cleaning requires you to have cleaning agents and tools which will not contribute to damaging the surface of the glass. For instance, if you are to clean a hard stain from the frosted glass, you may need to use steel wool. However, the steel wool should be qualified to wash the frosted glass windows. Using the wrong grade of the steel wool would end up causing scratches on the surface of the frosting film. This is a common practice among many homes and office owners. In such a situation, they are then required to replace the frosting film to maintain its aesthetic nature. Using paint sprays for the frosted glass panels is also an approach used by many homeowners, contractors, and interior designers. If you are looking forward to understanding the different ways of taking care of your frosted glass panels, this article provides a variety of ways that you can use to take good care of the frosted glass panels in your home or office. 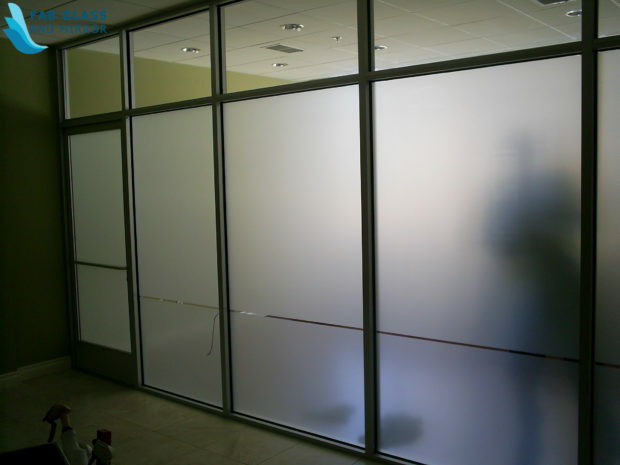 Frosted glass sprays are popular among home and office owners for the decoration of the interior glass partitions. The application of the Frosted glass spray is easy as it only requires the one applying to clean the surface of the frosted glass panels. The spray is then directed towards the windows glass to form the frosted film. The thickness of the frosting film is dependent on the needs of the home or office owner. When a thick film is needed, more spray paint is used on the frosted glass window. This is a common practice with interior designers who need to introduce a form of improved security and privacy within the living spaces. Additionally, there is the possibility of customizing the frosting glass using the frosted glass spays. With premade stencils, a designer can create desired styles on the frosted glass panels to make them unique in the long run. However, the application of the frosted glass spray requires precision to avoid errors which would result in unattractive designs on the windows or doors. With the frosted glass spray, you can use it to hide scratches that may be visible on your windows or doors, with the hidden scratches, the interior or exterior of your office or home looks flawless and attractive. If you are looking forward to making your insulated glass windows, doors or interior glass partitions in your office or home to be more translucent, using frosted glass spray can be helpful. Plain frosted glass panels are most suitable for offices and home that require more natural light to come through. With the plain frosted glass, you do not need to incorporate other extra designs to make it look attractive. The plain frosted glass requires regular cleaning to avoid any formation of stains. When stains on this type of glass, they are visible due to its clean nature. The plain frosting film is used to make the plain frosted glass which can be used on windows or doors of your office or home. When you need to add an extra layer of the plain frosting film on your doors or windows, you need to consult an expert so that they can recommend high-quality materials that will leave your glass windows or doors flawless and attractive. Using low-quality frosting film can be detrimental to the aesthetic of the living area where you install them. Cleaning the plain frosted glass panels with cleaning agents several times in a week can help to maintain its clarity. However, you should at all times avoid using harsh cleaning agents because they corrode both the frosting film and the glass. You don’t want your frosted glass to look unattractive because of the formation of a stain. For frosted glasses that are used for the exterior walls or windows, there is the possibility of hard getting hard stains from had water. Grass sprinklers in the yard are common sources of hard water that splashes on the windows of a house. Adding a waterproof layer to the frosted glass can be helpful in avoiding contact between the glass and the hard water. With the waterproof frosted glass spray, it forms a thin layer on the glass that is waterproof to water. It is comparable to a layer of oil that has high resistance to water. In case of water falling on the surface of the glass, with waterproof glass spray, the water drips away and does not remain on the glass. This way, there is no need to wipe the glass when it comes into contact with the frosted glass panels. When selecting the waterproof frosted glass spray, always ensure you get the high-quality one that will not cause abrasion on your glass. Buying unauthentic waterproof sprays may cause damage to the glass windows which will end up costing you more money for repairs or replacement. When there is yellowing on frosted glass, it is mostly caused by the accumulation of dirt and failure to cleaning regularly. To remove the yellowing on the frosted glass, you can use a vinegar solution. Using a vinegar solution and a soft sponge, rub it on the yellowing part of the frosted glass panels. Continuously doing this with a microfiber cloth will help to remove the yellow stain from the glass. Additionally, if the yellow stain does not get off using the vinegar solution, using baking soda is an effective alternative solution. The same process of scrubbing the yellowing part should be followed if you are using baking soda. After cleaning the yellowing part, clean the frosted glass normally to remove any type of dirt that could be remaining on the surface. This way, you will be able to maintain a positive aesthetic look of your windows or doors. How do I clean a dirty window? Cleaning a dirty window is dependent on the type of dirt that is accumulated on it. For instance, if you are cleaning dust from the glass surface, you can use a soft sponge with clean, soft water. Avoid using hard water as it could result to formation of stains. Consequently, when removing grease or stains from the surface, you will need to use certified cleaning agents which you can get at Fab Glass and Mirror. They provide high quality cleaning agents that will leave your glass windows shining and in good condition. Use Windex on frosted glass? When cleaning glass surfaces with water, failing to wipe them properly leaves streaks behind. Having streaks is unattractive when on frosted glass and should be avoided at all costs. Using Windex on frosted glass helps to avoid any form of streaks on it and leaves the surface shiny. The Windex is of high quality and does not leave any streak if used properly. For most people who do not have Windex, they rely on newspapers to wipe off any dirt or water from frosted glass surfaces.